I recently read one of the best books I’ve read in years – ‘Lost Connections: Uncovering the real causes of depression and the unexpected solutions’. It is both bold and inspiring and I would encourage everyone to read it. Lost Connections challenges the theory that depression is not just a chemical imbalance but that one of the primary causes is a loss of connection. Hari discusses a number of important connections that when lost, can result in poor mental wellbeing. Whether you are suffering from a mental health challenge or not (1 in 5 of us are at this very moment), I truly believe this book can help far more than just those who suffer – it can help us all understand the reasons why. In today’s challenging corporate environment, mental health wellness is as important as physical health wellness. Deloitte recently reported at least 77% of the workforce has experienced a mental health issue at some stage in their career – with only 11% of those having ever spoken about it. Mental health wellness is at the core of every challenge we design. Challenges allow people to reconnect in a way that may not be possible in every day life, particularly in a corporate environment. Trekking through some of the most remote parts of the world, disconnected from the daily grind, provides an opportunity to actually reconnect with people. It provides a chance to ask people how they actually are. Walking side by side with one another provides a healthy platform to have meaningful conversations and subsequently form connections with others. It is fascinating to watch the bonds that are formed as a result of this. I don’t think anyone has left a challenge without making new friends – or in this case, meaningful connections with other human beings. Normally, many. Our schedules are busier than ever before and too often we are guilty of not making enough time to be outdoors. By being in nature, sleeping under the stars and trekking through the wilderness, we are forced to concentrate on survival and appreciate that we are part of something much bigger than ourselves – whether it be mountains, wide open desert plains or huge star filled skies. Challenges reconnect us with nature – its external reality but most fundamentally, our inner appreciation of it. Nature is powerful, often times beyond our understanding. When people are asked to reflect on what really matters to them they usually admit to deep values such as meaningful work, community, family, or being a loving person in service to others. All our challenges raise money for those far less fortunate than ourselves, providing participants with a way to give back and reconnect with these values in a meaningful way. Our challenges provide an opportunity for corporates and their people to reconnect with what is important. It is an opportunity for companies to demonstrate to their employees that they do care. Whilst challenges may only be a week, I believe they offer a platform to make more permanent changes resulting in reconnecting with what is important and subsequently improving mental health wellbeing. Lucy is passionate about philanthropy, sport, mental health wellness, entrepreneurship and bringing out the best in other people. Whilst working for one of the world's largest FTSE 100 companies, she voluntarily organised two major charity challenges across the Gobi and Sahara Deserts, raising over 500,000 USD for WaterAid. Lucy saw an opportunity to deliver challenges on behalf of other organisations which led to her resignation from HSBC to start Just Challenge in October 2017. 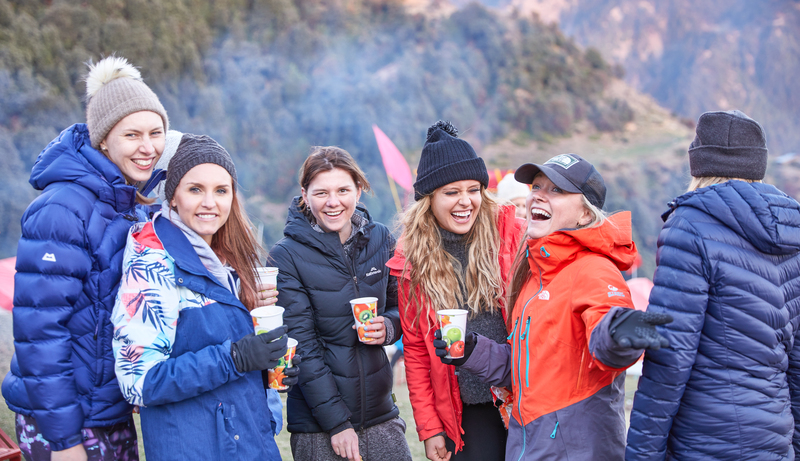 Just Challenge delivers life changing experiences for some of the world’s leading organisations and their people – taking them out their comfort zones to incredible locations around the world. Their mission is to improve employee engagement, develop leadership skills, drive CSR initiatives and deepen client relationships. Their clients, participants and ambassadors include HSBC, KPMG, Barclays, UBS, Laureus, Michael Vaughan, Kenton Cool and Brian O’Driscoll - having now raised over 1million USD for charities. Just Challenge combines purpose with profit. Lucy has created a brand that significantly improves peoples’ lives – both those that take part in the challenges and those that benefit from the funds raised for charity.